Sea ice is a crucial parameter within Earth's climate system. Understanding its dynamics and its response to other climatic variables is therefore of primary importance in view of a warming climate and sea ice decline. In this work we investigate some features of a chemical parameter in ice cores, bromine enrichment, which is linked to sea ice and can therefore be used to reconstruct sea ice in the past. The primary productivity in the Southern Ocean (SO) is limited by the amount of iron available for biological activities. Recent studies show that icebergs could be a main source of iron to the SO. Based on remote sensing data, our study shows that iceberg presence is associated with elevated levels of ocean productivity, particularly in iron-deficient regions. This impact could serve as a negative feedback to the climate system. We analyze 25 flight lines from NASA's Operation IceBridge Accumulation Radar totaling to determine snow accumulation throughout the dry snow and percolation zone of the Greenland Ice Sheet. Our results indicate that regional differences between IceBridge and model accumulation are large enough to significantly alter the Greenland Ice Sheet surface mass balance, with implications for future global sea-level rise. Observed trends of Antarctic sea ice are not reproduced by global climate models. We examine observed and simulated interactions between sea ice and large-scale atmospheric variability, showing that global climate models generally capture observed interactions during the season of sea ice advance, but not during sea ice retreat. 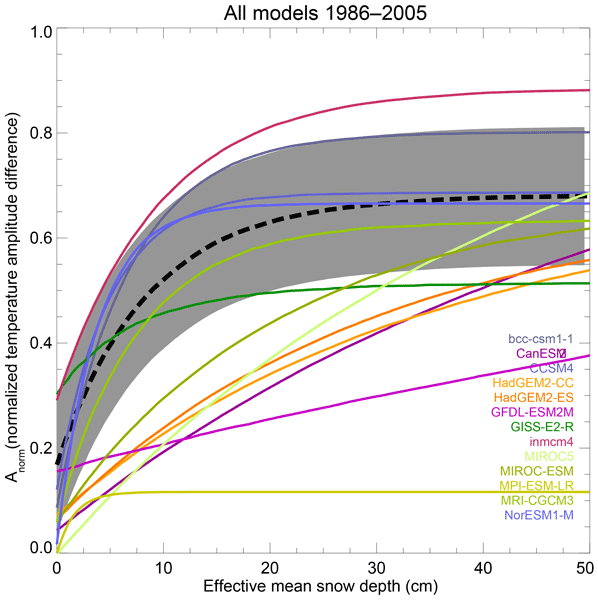 Most models overestimate the zonally symmetric influence of the dominant atmospheric mode on sea ice, while the importance of tropical variability is underestimated. In this study the dynamics of the world’s northernmost ice cap are investigated with a 3-D ice flow model. Under 1961–1990 climatic conditions an ice cap similar to the observed one is obtained, with comparable geometry and surface velocities. The southern part of the ice cap is very unstable, and under early-21st-century climatic conditions this part of the ice cap fully disappears. In a projected warmer and wetter climate the ice cap will at first steepen, before eventually disappearing. While gathering data on a changing environment is often a costly and complicated endeavour, it is also the backbone of all research. What if one could measure elevation change by just strapping a camera and a hiking GPS under an helicopter or a small airplane used for transportation and gather data on the ground bellow the flight path? In this article, we present a way to do exactly that and show an example survey where it helped compute the volume of ice lost by a glacier in Svalbard. We investigated the internal structure of two alpine rock glaciers to derive information on their development. Through a 3-D mapping of the electrical resistivity distribution of the subsurface, we could detect variations of ice content and delimit frozen and unfrozen structures. Our study shows that the development of the investigated rock glaciers is influenced by not only creep processes and remnant ice from past glaciations but also recently buried ice patches and refreezing meltwater. Snow has a profound impact on permafrost and ecosystem functioning in the Arctic tundra. This paper aims to characterize the variability of end-of-winter snow depth and its relationship to topography in ice-wedge polygon tundra of Arctic Alaska. In addition, we develop a Bayesian geostatistical method to integrate multiscale observational platforms (a snow probe, ground penetrating radar, unmanned aerial system and airborne lidar) for estimating snow depth in high resolution over a large area. We present in this work a new statistical permafrost distribution model that provided a more detailed, locally adjusted insights into mountain permafrost distribution in the semi-arid Chilean Andes. The results indicate conditions favorable for permafrost presence, can be present in up to about 6.8 % of the study area (1051 km2), especially in the Elqui and Huasco watersheds. This kind of methodological approach used in this research can be replicable in another parts of the Andes. The production of machine-made snow is generalized in ski resorts and represents the most common adaptation method to mitigate effects of climate variability and its projected changes. However, the actual snow mass that can be recovered from a given water mass used for snowmaking remains poorly known. All results were consistent with 60 % (&pm;10 %) of the water mass found as snow within the edge of the ski slope, with most of the lost fraction of water being due to site-dependent characteristics. In this study, we combine UAV (unmanned aerial vehicles) images taken over the Bowdoin Glacier, north-western Greenland, and a model describing the viscous motion of ice to track the propagation of crevasses responsible for the collapse of large icebergs at the glacier-ocean front (calving). 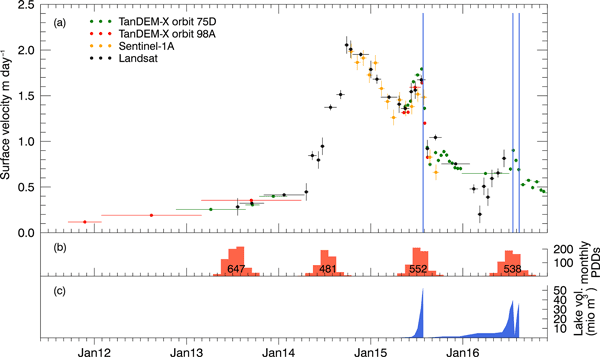 This new technique allows us to explain the systematic calving pattern observed in spring and summer of 2015 and anticipate a possible rapid retreat in the future. We investigate long-term climate reanalyses datasets to infer their quality in reproducing snow depth values compared to in situ measured data from meteorological stations that go back to 1900. We found that the long-term reanalyses do a good job in reproducing snow depths but have some questionable snow states early in the 20th century. Thus, with care, climate reanalyses can be a valuable tool to investigate spatial snow evolution in global warming and climate change studies. We propose a sub-seasonal timescale based on pollen analyses for a Mt. Ortles firn core. The method can be applied to all types of glaciers, provided the proximity of the pollen source and a negligible time lag between pollen production and its deposition on the glacier. By combining pollen dating with a mass balance model we found evidence that pollen grains are resilient to downward transport by percolating water and that pollen shows a high potential for inferring past climatic conditions. Climate variations might change the frequency of typical weather conditions. We present a weather pattern classification as an useful tool for identifying changing glacier wind regimes. We show the intensity of turbulent heat exchanges between ice and air changes with these regimes, as well as the importance of discrepancies between bulk-aerodynamic and eddy-covariance fluxes. The results suggest these discrepancies influence melt estimates from surface energy balance calculations. Rock glaciers are abundant in high mountains in western China but have been ignored for 20 years. We used a new remote-sensing-based method to map active rock glaciers in the Chinese part of the Tien Shan and compiled an inventory of 261 active rock glaciers and included quantitative information about their locations, geomorphic parameters, and downslope velocities. Our dataset suggests that the lower limit of permafrost there is 2500–2800 m.
This paper shows that the surface melt increase over the Greenland ice sheet since the end of the 1990s has been unprecedented, with respect to the last 120 years, using a regional climate model. These simulations also suggest an increase of the snowfall accumulation through the last century before a surface mass decrease in the 2000s. Such a mass gain could have impacted the ice sheet's dynamic stability and could explain the recent observed increase of the glaciers' velocity.